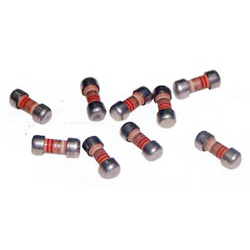 Manufacturer of Cement Resistors, Wire Wound Resistor & Metal Film Resistors. 1. High solderability due to specially platd electrodes. 2. Electrodes strength is higher than flat chip resistors. 3. Suitable for reflow, flow and iron soldering. 1. Watt: 1/8W, 1/4W, 1/4WS, 1/2WS, 1WSS, 1WS, 2WS, 3WS. 2. TOL: ± 5%. 3. Value range: 1Ω~10MΩ.